- We arrived in Iceland at different times. All of us stayed in Hotel Kríunes in Kópavogur. 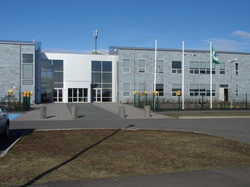 - Students and teachers in Vatnsendaskóli welcomed visitors. 3rd grade sang to us, and grade 7th presented their school through a video. Then they presented all the countries in the project through PowerPoint presentations. - We had a guided tour in school to see some of the classrooms. - We visited grade 3 and 7 to talk to the pupils and to tell them about our countries, our school and the project and a lunch in the school canteen. All had worked on the dictionary, measured the weather and visited an energy producing company. Malgo told about problems opening some other dictionaries on the website. Poland has visited a nuclear power plant. The Polish timeline is put in the dropbox and can be seen as video. Poland has had one visit to power plant. It was one using coal. They have had another visit to a nuclear energy institute, which is just for experiments and research. In Poland the pupils have measured how much water they use in their homes. They have also calculated how much it costs. Further they have discussed how to save water. In Greece they work on environmental problems on Chios and how they affect the island. They want to communicate via SKYPE which they already have tried. The Estonians have visited an oil shell mine. They are working on the environmental situation in Estonia and on trash and recycling. In Italy they are cooperating with the experts in the Caffarella Park. They have studied the ancient Romans and how they managed to have warm and cold water in their houses. They study history and the houses in ancient Rome, how they used rainwater and they study aqueducts. They have done a remarkable work on the timeline and made it as a big book. In Norway they have cleaned the local area near to the school and sorted the trash before they used a scale to find out how much they had found. They have made a registration of the weather in all participant schools in Excel. In Iceland they have worked on the newspaper and put some information in the dropbox. The pupils also measured how much electricity and water are used in their home. - In the afternoon we visited Museum Settlement in Reykjavík 871+2 downtown Reykjavík. The settlement museum tells the story of the development of Iceland and we can see the remainings of a Viking house. We also had a walk in downtown Reykjavík to see Iceland’s Congress, the Government and the Hallgríms-church which was closed when we came by. In the evening we had a very tasteful dinner from cod in an old house downtown Reykjavík. - We walked to Árbæjarpool to swim in the nice outdoor pool. - We had an outdoor lunch with the pupils in 3rd grade before we walked with the pupils to Museum Árbæjarsafnwhere we could see how homes in Iceland have developed the last hundred years. Project meeting: - What to print in the newspaper. Konstantina presented their ideas. She will send us detailed information on that. We put works we want to present on the common website in the dropbox and send Reet and Karmen a message so they can load it on the website. If you can’t watch a video, you could try this program: ANY video converter. Visit to energy producing companies: All partners work out a document as a pdf-file. The document should show the picture with maximum five words in English and the native language. Each partner creates one page that might have maximum two pictures. In addition we write a couple of lines about the company. Number 13 in the application: The multilingual dictionary. We do it the same way as last time: Video where the words are written and read in English (start with this) and in the native language. Load it up in the dropbox. This work should be completed before the 12th of June 2011. - We were invited for dinner at Guðrun Soffía’s home. They served us delicious tastes from Iceland: Smoked and graved salmon and trout and lamb meat. And we had a pleasant evening together. - Outdoor education in Vatnsendaskóli: The visitors worked in one group each with students from grade 3 and 7. All the groups had a paper with all the tasks written. We were supposed to find objects with certain qualities, to measure the temperature in the water, to measure the square meters of the quay and to find the circumference of the football lane. The pupils then had the opportunity to speak English and to be together with the guests for a while. To the visitor it was nice to be together with the students. - Visitors from the Municipal School Committee told us about how they regard Vatnsendaskóli, the work they do and what they think about our project which they find very interesting. They told us a little about pupils with special needs and how they are integrated in school and what possibilities they have. They work as much as possible in their home school where there are educated teachers to take care of them and their learning. - Presentation of Vatnsendaskóli which opened on August 22nd 2005. The school has a curriculum based on respect, friendship, cooperation and creativity. At the moment there are 398 students but the number will increase. - Visited art classrooms and some other classrooms, too. It was nice to see such a good equipped school where everything seems to be very well organized. Project meeting: Iceland had the task to make a questionnaire for the pupils to answer some questions about the website of the project. The group read it and decided what questions should be asked. Every student taking part in the project should answer the questionnaire before 12th of June. “Research on housing materials, energy resources and consumption”: We will ask the pupils how they want to work on it. Each country does their research on houses they live in nowadays. The students make a PowerPoint presentation with photos, drawings and text. We focus on the local conditions. The presentation will be finished before the meeting in Tallinn on Oct 18th. We decide on how to evaluate the work when we meet in Estonia. The PowerPoint will be parted in: Materials, Resources, Consumption, Architecture and Lifestyle. The PowerPoint will be presented in English. In the end of the PP the students conclude on how all the five parts affect each other. What is lifestyle? The students regard it from a child’s point of view referring to their family and home and on saving energy (water, electricity, heating and transport). The visit in Chios: We’ll meet on 12th to 17th of June 2012. - Visiting the Blue Lagoon where we had a common dinner after the refreshing bath. A great end of the working day! The Golden Circle with departure from Vatnasendaskóli in a hired bus. Our hosts took us to Geysir, Gullfoss and to Þingvellir. Our guide –Guðrun Soffía’s husband – made the trip even better with his information and small stories. On our way to Þingvellir we had a stop near Laugarvatn to buy some smoked fish. Then we went on to the nice cottage of Guðrun Soffía’s daughter and son in law where we had a delicious lunch. Some of the guests showed folkdance from their country and we all got a special present from our hosts: a transformed bottle and an Iceland designed candle and napkins. The last stop was at Þingvellir – the Old Parliament of Iceland. This trip was a great experience for the guests. In the evening we had dinner in our hotel Kríunes in Kópavogur.